Today I bring you the most easiest desserts to make, Oreo Truffles. Yep, you heard right, Oreo Truffles. I've been making these delicious truffles for about three years now and they are all over the interweb, so I'm sure most of you, if not all of you, have heard of these goodies. My daughter got Star Student of the week, so I had to make her classmates some goodies over the weekend and this is what she asked for, "the chocolate balls," as she calls them. LOL! I had to correct her since she was going to be explaining to the class what she had brought them. I'm so proud that I didn't make any extras (I started weight watchers, yay me!) and made them the night before she had to go to school so that hubby and I wouldn't be tempted to have one. It was hard, but I did it. Enjoy! Chop Oreos up in a food processor. Add smashed Oreos with softened cream cheese until it's well combined. Roll into 1 inch balls and place on wax covered cookie sheet. Put into freezer for about 15 minutes. While the Oreo balls are in the freezer melt your candy melts in microwave. 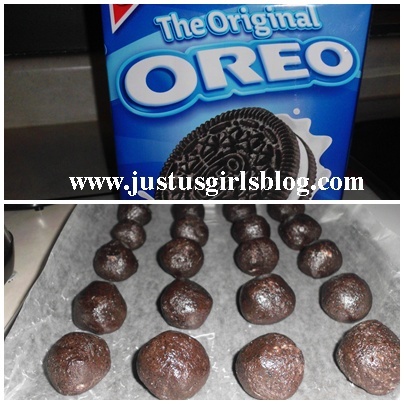 Take Oreo balls out of the freezer and dip in chocolate. I live under a rock, apparently...I've never heard of these yummy treats before. New to me as well but sure look good. Simple too, that's the best part! My sister in law made these for me and I thought they would be SO complicated. Thanks for sharing! I made the Chips Ahoy cookie balls at Christmas. Loved them! I need to try these next! Yum! We made these at Christmas time and lets just say there were none left afterward! So yummy!! !